International SOS releases every year a worldwide medical rating that rates countries by their health care risk. Considering there is risk everywhere, due to many factors, many countries have a good standard of medical care and that means they pose a low risk for who goes under medical care there. The medical rating is based on the standard of local medical and dental care available, the access to prescription drugs, the presence of serious infectious diseases and cultural, language or administrative barriers to access health care. The rating divides countries by very high, high, medium, low medical risk and rapidly developing. Most countries in Europe and North America have a low medical risk, including Portugal. Countries like Turkey, Poland, Hungary, and Mexico are considered medium risk countries for medical care. These countries are known for their low prices for health care and are popular among those who chose to go abroad for medical care. Although there are great health care facilities in these countries, a quality standard isn’t always met and in some cases the medical care goes wrong and patients get serious injuries. In Portugal the access to medical care is widely available in both public and private facilities and Portuguese medical professionals are recognized internationally for their work. Medical Port has partnered with the most outstanding health care facilities and doctors to give our clients the access to the best options and provide effective treatments. Learn more about the Travel Risk Map here. Learn more about Medical Port here. Every year Condé Nast reveals the hotels and luxury spas with their seal of approval, which guarantees an exceptional experience, according to them. Hotels around the world receive this distinction every year and that makes them part of an exclusive group of hotels, spas and resorts with the finest qualities that every luxury traveller seeks. In Portugal 14 hotels were distinguished with this seal in 2016. From the south to the north of continental Portugal and in the Azores Island, the publication highlights the best hotels and resorts that will please the most exquisite travellers. Click here to see the full hotel list and the description of each luxury hotel in Portugal selected by Condé Nast. According to AFAR travel magazine, Portugal was the most visited non-US location in 2015 and is the 5th must go destination for 2016. AFAR analysed the most searched terms and cities for trip planning in 2015 by their website visitors and compiled the list of the most visited places. Portugal is number 2, only followed by the American city of New Orleans. All these reasons make Portugal the most popular non-U.S. destination of 2015 and probably 2016. Read the full articles here: NY Daily News and AFAR. Portugal and the Portuguese people have been known for their hospitality throughout the years. From tourists to expats, foreigners tend to feel well received in Portugal not only because what the country has to offer but also from the friendliness of Portuguese people. One of the reasons why Portugal is gaining so much popularity as a place to retire abroad is because English is widely understood and spoken. Expats in Portugal can have a great living experience even if they don’t speak Portuguese, as English is widely spoken in the country. Another reason is due to the fact that the country welcomes foreigners with ease and there’s a great tolerance towards other cultures. Portugal is one of the countries where English is more widely spoken in the whole world. According to the ranking by EF , Portugal is the 13th country in the world with the best English skills. In the 2015 English Proficiency Index, Portugal is placed among the countries with the better English skills, categorised as a country where people have a high proficiency of English. There were 70 countries analysed in the index. The top places belong the Northern European countries and the bottom places belong to countries in the Middle East and Asia. Also according to the Global Peace Index by the Institute for Economics and Peace, Portugal is the 11th most peaceful country in the world. Portugal is considered to be “very high” in terms of peace. The Global Peace Index is “The world’s leading measure of national peacefulness, the GPI measures peace according to 23 qualitative and quantitative indicators”, according to the Institute. The ranking evaluated 162 countries in the world for several indicators like perceptions of criminality, intensity of internal conflict, neighboring countries relations, among others. Portugal got minimum scores in almost of all of these indicators, meaning the country has low representativeness in those indicators. U.S. News gathered the list of the best retirement spots for American golf lovers to retire abroad. 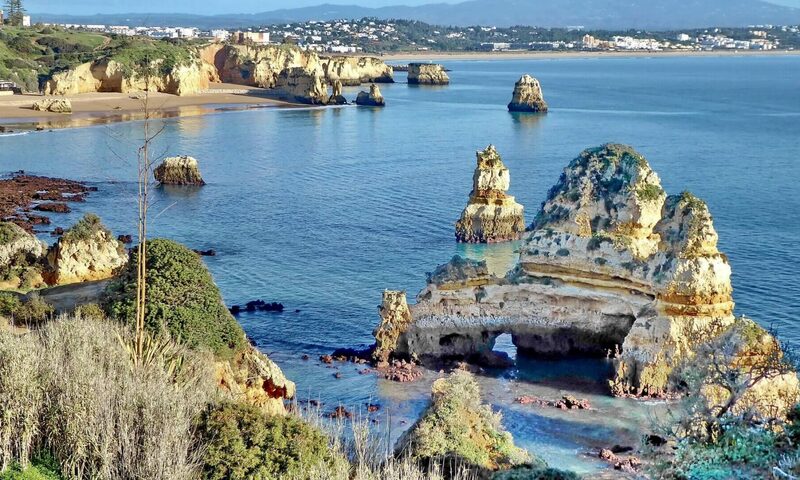 After being recently named the best region in the world to retire abroad, the Algarve is getting the attention of the press all over the world as we wrote in a previous post (click here to read it). In the Algarve (as well as in the entire country of Portugal) the sunny weather attracts many expats who enjoy the Mediterranean style food, the reasonable cost of living and the overall quality of healthcare and other important services for expats living in Portugal. The other countries in the top 10 of the best retirement spots for golfers are: Nicaragua, Italy, Vietnam, Thailand, Argentina, Mexico, France, Dominican Republic and Ireland. Click here to see the full list. Lisbon’s Aquarium (Oceanário de Lisboa) was recently voted the best in the world according to TripAdvisor users. The 2015 Travelers’ Choice Award winners by TripAdvisor were revealed recently. The Lisbon Aquarium has 11579 reviews from which 10745 either classified it as “Excellent” or “Very good”. These reviews made Lisbon Aquarium to the first spot in the best aquariums list in the world. Last year, Lisbon Aquarium got the second place, and this year, changed places with Georgia Aquarium in the United States. The variety of marine species (animals and plants) and the education on nature and water conservation and preservation are the strong points of the Lisbon Aquarium. It is also considered the number 1 attraction to see while in Lisbon and should be visited at least half a day, according to the reviews of previous visitors. ABC News, wrote “Put these on your bucket list: World’s top zoos, aquariums and more” after the winners were announced by TripAdvisor.